I was shocked. So shocked, in fact, that the truth just popped out of my mouth with no filters or forethought. I let the “brag” comment go by and asked about her work and discovered that she had none and seemed to feel there were no prospects. She was moving away at the end of the month and her demeanor was one of defeat and unhappiness. I wished her well in her new home and many job prospects to come and bit my tongue on any advice about how to decide to make happiness a part of her life. Prayer would have to do. This was not the time, place, or person, but it did get me thinking about it. If you are reading this, you probably have Burning Mouth Syndrome (BMS) or another chronic pain condition, or you love someone who does. There is a great deal of depression and sadness that can come with that package, and this may not be the time or place for you to think about it, but consider adding it to your “to-do” list. Science tells us that the biochemistry of the brain is something we can affect by altering our behaviors. Read more HERE. I found this hopeful, but also a good warning not to let the “Nunnys” out there take us down their negative drains. 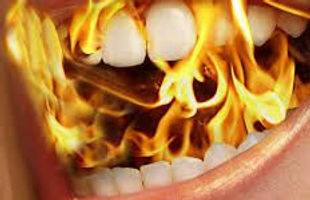 The article points out some very positive things we can do to help ourselves, and I am putting them on my tool belt for coping with Burning Mouth Syndrome. Here are my condensed versions of the wisdom in the article. Practice Gratitude. Feel it, show it, and express it. It’s a natural mood elevator. Change the Pattern. If you have a pattern of complaining or self-pity, try to be aware and cut that pattern off. You can even do it mid-sentence or thought! Try a new one to replace it. Patterns are often as strong as addictions and it will take time and effort to change them. Make a Choice. Choose to be happy regardless of the circumstances of your life. A choice is the most powerful thing in your life. You cannot change the world around you, but only you control how you react to it. Will you glow? Maybe! And maybe that glow will attract someone to you who will become a friend, a loved one, or simply someone you can help that day. Hi, Deb! Yes I am still suffering from BMS. May will be a decade and it sometimes feels like much longer. The Klonopin was prescribed by neurologist and I take 1 mg. of Orally Dissolving Tablets (they usually come in .50mg per tablet) and can take one more in the late afternoon if I need to. I rarely ever do. Klonopin (generic name Clonazepam) is one of the two most researched and recommended meds for BMS. The other is Neurontin (generic name Gabapentin) and I tried it but it was not as effective and had side effects for me. Check out the BMS Support Group website, too, and I hope you find a combination of meds and coping strategies that are helpful if you are suffering from BMS.